Some of you reading this article are probably contemplating that when you “retire,” the idea of earning some extra bucks selling real estate might be just the right ticket to keep your mind sharp and your wallet full. After all, how hard is it? Well, ask realtor Carole Schiffer – it’s pretty hard, and it’s extremely competitive. Carole is one of 1.2 million members of the National Association of Realtors in the US, but that’s where the similarity stops. Using the most advanced real estate tracking software … staying connected with social media … and having an advanced, user-friendly website that contains a broad array of up-to-date real estate news – have all enabled Carole to become one of Coldwell Banker‘s top real estate agents, ranking in the top 500 out of 140,000 CB agents nationwide. And she does it in one of the country’s most competitive markets – Brentwood, Bel-Air and Beverly Hills. Her average sale is more than $2 million, and despite the economic downturn in the real estate market in past years, this has been one of her best years. BTN: What keeps you at the top? Carole: There’s really no secret. The fact is that “location” remains an imperative in staying at the top in CB’s national network. I am blessed to work in one of the most attractive areas in the world. But honestly, it’s just hard work and staying positive in a very competitive market that is populated by some of the world’s most successful agents. And to stay competitive, I take advantage of the online programs that Coldwell Banker provides, but I also deploy my own online initiatives to differentiate myself from others. You cannot afford to be a “me-too”, even with a quality firm such as Coldwell Banker. Besides keeping up, I take advantage of my communications skills and constantly build relationships with my client base. This remains a relationship business and will always be that way. BTN: Who is your market? Carole: My ‘market’ stretches from Malibu to Beverly Hills to Bel Air to Marina del Rey, and I am blessed with the privilege of selling some of the world’s finest residential real estate. Westside Los Angeles is also rich in community assets, including some of the world’s most beautiful seashores, education (UCLA), culture (The Getty and many outstanding museums), shopping and dining. And of course, there’s the weather. From Day One in my real estate career, I have continued to invest in my community through a variety of non-profit organizations and civic activities. Real estate is all about building your personal brand. BTN: How has the business changed? Carole: I started my business when we didn’t have the Internet, email, social media, and digital real estate services that have now flooded the Internet. In the 1980s and early 1990s, there was a lot of hand-holding and we spent a lot more time scrambling around West LA in our cars (and in traffic) showing homes and shepherding transactions through escrow. This frantic pace continues, even with the best technology. If fact, there is more hand-holding going on today because the transactions have become more complicated. And there are more forms, not less. The environment is much more litigious, and the liability for agents has greatly increased. For every real estate transaction in California – a tree loses its life! Regulations and laws are much more complex and wide ranging, and it’s a challenge to stay up with it all. What has also changed is that my neighborhoods and communities have become “hot” properties on the global market. Los Angeles’s Westside is one of the hottest destinations for foreign/US buyers – they want to be here because it consistently has retained higher property values. Given these assets and opportunity, I joined the best broker in the area (Fred Sands) who then sold to Coldwell Banker in 2000. Coldwell Banker dominates the greater Los Angeles area – as well as the entire US market in terms of total sales and listings. It has consistently attracted the best agents – so “CB’s brand strength” extends to my brand. BTN: How does technology play a role in your success? Carole: I’m sure your readers are all computer literate – so are all of my clients these days. Most explore the many real estate websites that can drill down to specific listings and areas – long before they start their actual, on-the-ground search – and the latest statistics prove that out. So the Internet plays a critical role in how we deal with our clients – who come to me much better informed and prepared than before. One of my key marketing communication strategies is the use of emails. For the past six years, I have produced a unique online newsletter (The SchifferLine) which is sent on the first and the 15th of each month. One goes out to nearly half of my neighborhoods via email (I use Constant Contact); and the other goes out via regular mail to everyone in my prospecting area (which are called “farms”). 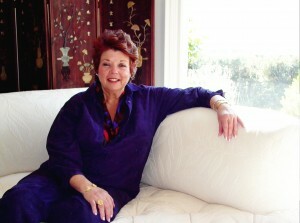 Each issue of the bi-monthly newsletters is posted on my web site (www.caroleschiffer.com) on the home page. This form of online and offline newsletter is, without question, my most important marketing tool because I deliver up-to-the-minute real estate news about their community twice a month. No other public medium does this. The advantage of Constant Contact is that I know exactly who opens my newsletter. And I have recently hired a Social Media Coordinator to address all of my social network demands. One of the interesting technology advancements that has really saved agents enormous time and frustration is electronic signatures. Doesn’t sound like a big deal, but trust me, when you’re in Bel Air and have to travel to Malibu 20 miles away to get a document signed, you’ll appreciate just how valuable that technology is! And as we become more international today, having the electronic signature is a big factor in closing a transaction, because time is always of the essence. Carole: On the advice of my marketing consultant, I invested heavily in building a brand identity more than 15 years ago, which I still have. I branded everything with my unique color scheme and logo … and it went on all of my stationery, business cards, lawn signs, advertising, website, and a vast array of marketing materials from post cards and brochures to e-marketing tactics on a broad scale. I did not use the Coldwell Banker-branded materials unless I had to. I wanted to differentiate myself from all of the other CB agents in my office and in West Los Angeles. The wonderful news about my identity is that it is still current, still attractive, and I get compliments all the time on how beautiful my communications are. How do I differentiate myself from 1.2 million Realtors? I position myself as the community expert on the Westside, providing prospects with a plethora of detailed information about each of the major communities I serve. The knowledge I have of the communities I service is what sets me apart. But more importantly, I know my neighborhoods inside and out. I know property values, real estate trends, I keep up to speed on financing and mortgage rates, and I have a vast and valuable network of clients and agents with whom I work. But perhaps one of the strongest branding efforts over the past 30 years has been my community involvement – having founded and produced the Great Tastes of Brentwood for 20 years … member of area Chambers of Commerce boards … active in some of Los Angeles’ many cultural organizations. These all play a key role in building my brand. BTN: How would you sum up your branding and technology connection? Carole: Even with all the new, great technology, this is still a person-to-person business. You have to be an expert on so many levels – and it doesn’t hurt to be a damn good psychologist, either. But that’s another story. I have built my business on being the most efficient, most effective Realtor I can be – but you still have to build relationships with your clients and fellow agents. It’s a relationship business more than ever. Clients have to trust you … they have to respect your advice and your skills. Agents, too, have to trust you and respect your relationship, not only with them but with your clients as well. I have had some terrific mentors, such as Tom Ferry (currently) and Fred Sands, and I have a great support team of marketing and administrative staff. We’re moving to improve our social media experience and we are always looking for ways to better connect with our clients and prospects. One of the privileges I have had with Coldwell Banker is that I am the company mentor in our Brentwood office. I work with all the new agents who enter the business, which is a responsibility and an honor. It’s very stimulating and gratifying to help younger agents enter our profession.